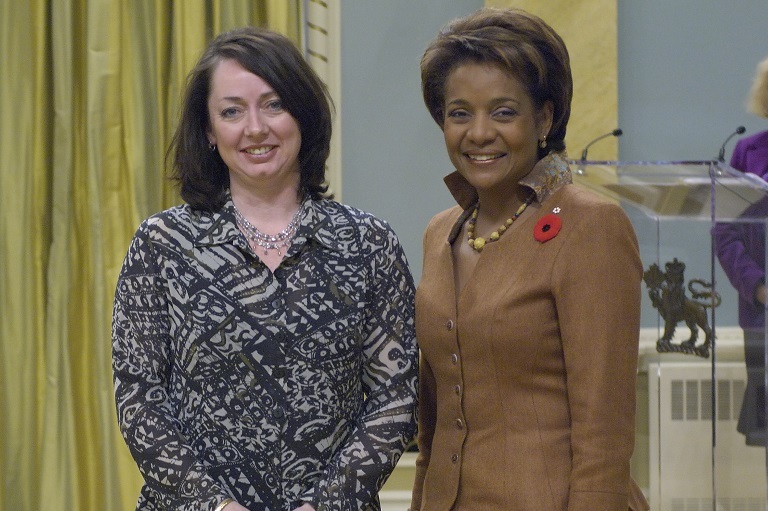 Monique Martin accepting his award at Rideau Hall, 2007. The Stops with History project completed by Monique Martin involved 58 grade 7/8 students from Georges Vanier Catholic School (a designated Fine Arts School), in Saskatoon, Saskatchewan. They created 22 large advertisements/ posters that were displayed on the Bus Shelters on the Saskatoon Transit System/Bus Routes in May of 2007. The posters detailed a historical event, place or person in Saskatoon History through text and image. The students also created 21 interior bus advertisements detailing an aspect of Saskatoon History. All the interior ads were on the one city bus for the month of May. Using the Local History Room at the library, print resources and the help of local archivists and interpreters from various centers in Saskatoon the students gathered the required information and images for their historical topic. The project involved 42 community partners in various ways, and over 25 large and small sponsors. The students from grade 3–8 developed a website about the project. The project was funded in part by a Saskatchewan Arts Board–Arts Smarts Grant. The Canadian Artists and Canadian Inventions project also completed by Monique Martin had the students researching Canadian Art and linking it to Canadian Inventions. Through a technique called synectics (force fitting of ideas) the students found relationships between the Canadian Inventions and the Canadian artist’s work. All students learned about the inventor and about the artist. Many different mediums were used to depict the Canadian Invention studied in the style/medium of a Canadian Artist. The unit involved 189 students from grade K–8. The unit was also completed with the Extended Learning Opportunities program in the Greater Saskatoon Catholic Schools. Students that are high achievers can sign up for special workshops and Canadian Art and Canadian Inventions was one of the units offered this year. Monique is a professional artist who is able to teach the children many mediums and they are able to excel in many areas. Some of the artwork from the unit was included in a display in Viseu, Portugal at the International Society for Education through Art Conference. The students from Grades 3–8 developed a website about the project. Student projects were put on display at a local gallery for six weeks where over 3000 per week viewed the artwork.